Mark your calendars for the WestCoast Big Band Festival 2017! 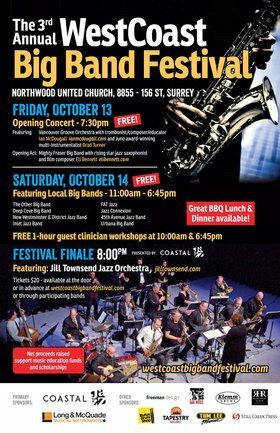 A full Saturday of FREE big band jazz performances by local groups in the Lower Mainland and Fraser Valley, accompanied by FREE instrumental clinic workshops by professional jazz musicians Ian McDougall (trombones), Brad Turner (rhythm section), Derry Byrne (trumpets) and Steve Kalestad (saxes)! Then treat yourself to an evening of amazing musicianship and big band jazz from the fabulously hip and swinging Jill Townsend Jazz Orchestra in our evening Festival Finale! Tickets $20 - available at the door or in advance at westcoastbigbandfestival.com or through participating bands. Join us in the FREE Friday night Opening Concert, starting off with the Mighty Fraser Big Band and special guest jazz saxophonist Eli Bennett, then featuring the Vancouver Groove Orchestra with special guest artists Ian McDougall on trombone and Brad Turner on trumpet! 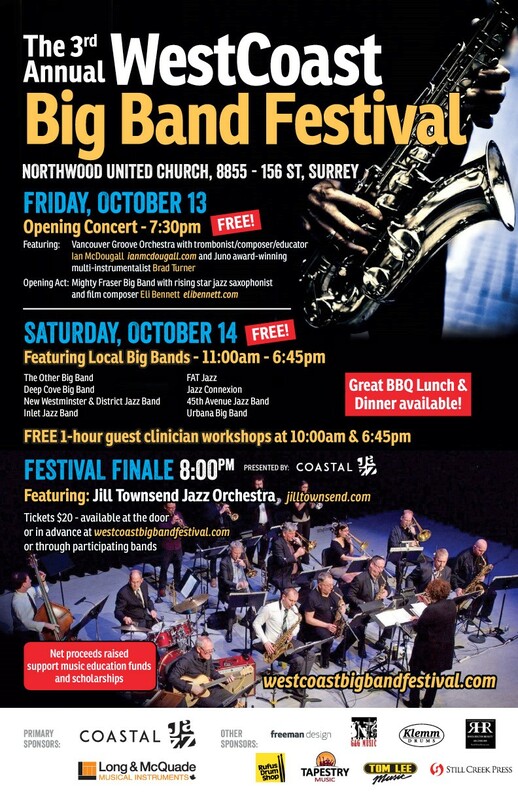 There are over 20 active community jazz big bands in the Metro Vancouver area and this event showcases a cross-section of that local music community, ready to perform and share their love of big band jazz!